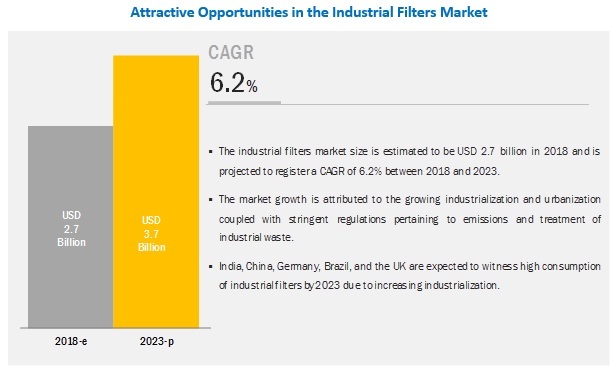 [130 Pages Report] The industrial filters market size is expected to grow from USD 2.7 billion in 2018 to USD 3.7 billion by 2023, at a CAGR of 6.2% during the forecast period. Growing industrialization and urbanization is a major factor driving the industrial filters market. The requirement of a safe working environment in industrial facilities is also driving the demand for industrial filters. By type, the liquid filter media segment is expected to be the largest segment of the industrial filters market during the forecast period. The liquid filter media segment is expected to account for the larger market size during the forecast period. On the contrary, air filter media is expected to be the faster-growing segment during the forecast period. Degrading air quality and global warming have forced countries to impose strict air emission regulations on industries to reduce the pollutants released in the air. These stringent regulations are expected to drive the industrial air filters market during the forecast period. By end-use industry, the market in the food & beverage end-use industry is growing at the fastest rate during the forecast period. Food & beverage is the largest as well as the fastest-growing end-use industry of industrial filters, where water is required for washing, beverage production, and processing purposes. Filtration in the food & beverage industry is a highly critical process. Increased food safety concerns, the addition of new product lines by various companies, and growing population are expected to boost the demand for industrial filters in this industry. APAC is the major revenue generating region in the global industrial filters market. The region is experiencing growth of various industries owing to the growing population. Growing industrialization and urbanization fuels the growth of the industrial filters market in APAC. Stringent government norms pertaining to emission and treatment of industrial waste in the region are also driving the industrial filters market. The key players in the industrial filters market are Valmet Corporation (Finland), Lydall Inc. (US), 3M (US), Ahlstrom-Munksjo (Finland), Clear Edge Filtration Group (US), Nordic Air Filtration (Denmark), Fibertex Nonwoven (Denmark), Sefar AG (Switzerland), Freudenberg Filtration Technologies (Germany), and Sandler AG (Germany). Valmet has a strong portfolio of filter fabrics solutions that are used in several end-use industries such as mineral, mining, chemical, pulp & paper, and food & beverage. Its strong focus on R&D helps in delivering innovative products. In November 2018, Ahlstrom-Munksjo launched a highly durable air filtration media, Ahlstrom-Munksjo Extia 1000. It will increase the filtration lifetime by more than 40% which will further help customers to extend operational duration before changing the filters. In October 2018, Fibertex Nonwoven planned to invest in a nonwovens production line for filter media. This new production line will use various polymers for the production of polyurethane (PU), polyvinylidene fluoride (PVDF), and polyamide (PA) for a wide range of applications. In August 2018, Hengst, the parent company of Nordic Air Filtration, acquired DELBAG, a German manufacturer of industrial filters products. This will further strengthen the company's position in the industrial filters segment and will also help the company to offer a wider range of products. Are there any upcoming hot bets for the industrial filters market? How are the market dynamics for different types of industrial filters? What are the upcoming opportunities for different types of industrial filters in emerging economies? What are the significant trends in end-use industries influencing the industrial filters market? Who are the major manufacturers of industrial filters? 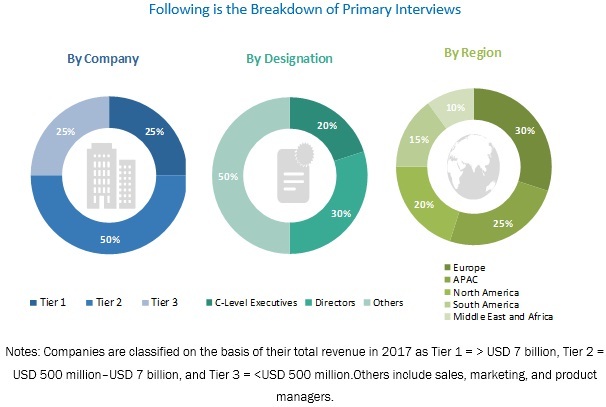 What are the factors governing the industrial filters market in each region? The study involves four major activities in estimating the current market size of industrial filters. Exhaustive secondary research was carried out to collect information on the market, peer market, and parent market. The next step was to validate these findings, assumptions, and sizing with industry experts across the value chain through primary research. Both top-down and bottom-up approaches were employed to estimate the complete market size. After that, the market breakdown and data triangulation methodologies were used to estimate the market size of segments and subsegments. 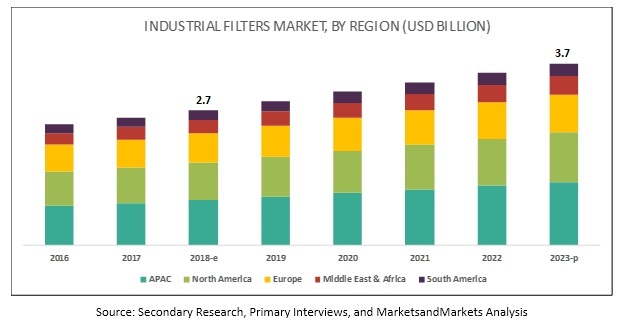 The industrial filters market comprises several stakeholders, such as raw material suppliers, distributors of industrial filters, liquid and air filtration associations, filtration equipment manufacturers, and regulatory organizations in the supply chain. The demand side of this market consists of food & beverage, chemical, pharmaceutical, power generation, pulp & paper, textile, and metal & mining industries; whereas the supply side consists of industrial filters manufacturers. Various primary sources from both the supply and demand sides of the market were interviewed to obtain qualitative and quantitative information. After arriving at the overall market size-using the market size estimation processes explained above-the market was split into several segments and subsegments. In order to complete the overall market engineering process and arrive at the exact statistics of each market segment and subsegment, the data triangulation and market breakdown procedures were employed, wherever applicable. Data was triangulated by studying various factors and trends from both the demand and supply sides. Micromarkets are defined as subsegments of the industrial filters market included in the report. Core competencies of the companies are determined in terms of their key developments and strategies adopted to sustain their position in the market. Valmet Corporation (Finland), Lydall Inc. (US), 3M (US), Ahlstrom-Munksjo (Finland), Clear Edge Filtration Group (US), Nordic Air Filtration (Denmark), Fibertex Nonwoven (Denmark), Sefar AG (Switzerland), Freudenberg Filtration Technologies (Germany), and Sandler AG (Germany). This research report categorizes the industrial filters market based on type, end-use industry, and region.